What type of countertops can you choose from? Granite. This is by far the most popular choice. Drawn from the earth, harvested natural granite is created in slabs so that it can be housed in homes all over the world. 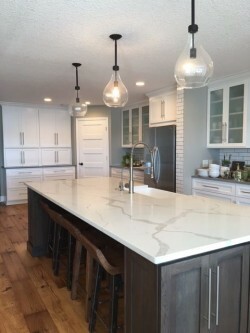 Being a natural element, it is not likely that every countertop will look the same, providing so many colors, designs and patterns to choose from. Because it is an element that is extremely durable, it may never need to be replaced. This countertop is so durable that you will never have to worry about cracking or scratching. If this countertop is used in the kitchen, there will be no concerns of it being destroyed under heat. Hot pans can easily be placed on them without damage. Like everything, granite countertops should still undergo the appropriate care and maintenance. Engineered Quartz. The word engineered is used in its name because it is not 100% quartz. About 5% of it is polymer resin. But do not disregard for this reason. With this combination, you are provided with a countertop of immense strength and durability. Jeffrey Court – Nob Hill Field Quartz give you the option to customize further than just its natural look by adding paint during the engineering process. It can even be manipulated to looking like granite, providing you a more affordable option to a look that might not be more on the expensive side. Like granite, it can withstand heat and is indestructible. One positive of this element is that it does not need to be sealed. This material is also used for backsplashes and larger areas where needed because of how durable and flexible it is. Marble. Are you looking for a more expensive look and feel? Agora’s marble tile is just the right stone to do the job. Like granite, Cosa Marble has a unique design that cannot be repeated. It is widely used across all design styles because of its natural look in color and pattern. It is, however, very difficult to maintain. Unlike granite and engineered quartz, avoiding permanent stains on marble can be almost impossible. It is also more susceptible to scratches and dents. So while marble stands out above the rest as the most elegant option, if your kitchen is used often, it may not be your element of choice. Solid Surface. This material is solely man made. It can accommodate any feel of the kitchen or bathroom without noticeable cut off areas, providing a sleek and seamless look to any room. This design provides the look of “money” even though it is one of the most economical choices. Because it is man made, it can be engineered to look like any surface wanted. However, like marble, it can be subject to bruising and surface damage. But as anything man made, it can repaired and made like new again.